PHOENIX, Arizona, March 5, 2014 (ENS) – Endangered jaguars will have 1,194 square miles of critical habitat in southern Arizona and New Mexico for their recovery, under a rule finalized by the U.S. Fish and Wildlife Service on Tuesday. The gold and black-spotted jaguar, Panthera onca, is the world’s third-largest cat, after tigers and lions. 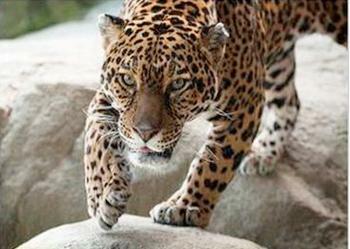 Jaguars once roamed from southern California through the Southwest and lived in Louisiana, Kentucky and North Carolina, but only six, possibly seven, jaguars, all males, have been detected in the United States since 1982, says the Service. No documented females or breeding pairs have occurred in the United States for over 50 years. The last female jaguar in the United States was shot by a hunter in 1963 on Arizona’s Mogollon Rim. Jaguars still live in Mexico and points south, and have been seen within 40 miles of the Mexico-U.S. border. But the big cats have largely disappeared from their U.S. range due to clearing of forests and draining of wetlands and killing to protect livestock. The species is categorized as Near Threatened on the authoritative IUCN Red List. 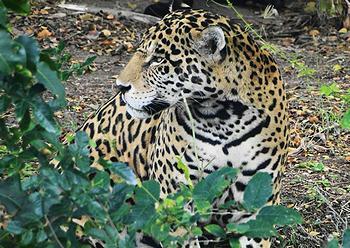 Conservationists say protected habitat in the United States will allow jaguars to naturally repopulate their former range as they move northward from the nearest core population in Mexico. “Welcome home, American jaguar,” said Michael Robinson of the nonprofit Center for Biological Diversity, which has filed three lawsuits over many years in support of jaguar recovery. “I’m hopeful that decades from now we’ll look back on this historic decision and see it as the first on-the-ground action that eventually led to the return of a thriving population of these beautiful big cats to this country,” Robinson said. The critical habitat designation prohibits federal agencies from destroying or “adversely modifying” the designated habitat by granting permits for mining or other commercial activities that would make the habitat unsuitable for jaguars. There is currently a jaguar living on U.S. Forest Service land in the Santa Rita Mountains outside Tucson in the footprint of the proposed Rosemont Copper Mine. The critical habitat designation makes it illegal for any federal agency to fund or authorize activities, such as mining, that would harm jaguar habitat. This jaguar is the first of the big cats documented in the United States since 2009, when, during an illegal capture operation, the Arizona Game and Fish Department injured, then euthanized, a jaguar that had lived at least 16 years in the Atascosa and Pajarito mountains. The Rosemont Copper Mine is proposed by Augusta Resource Corporation, a publicly-traded metals company based in Vancouver, Canada. Rosemont hosts a large copper/molybdenum reserve, and the company estimates it would produce 243 million pounds of copper per year, which would make it the third largest copper mine in the United States. The project is located in Pima County, Arizona, in an undeveloped area 30 miles southeast of Tucson. “We are confident that thoughtful analysis will relegate the faux science and bullying tactics of the Center for Biological Diversity as activism, and that the agency will see that designation of critical habitat in other areas may be warranted for the conservation and recovery of the species, but not the northern Santa Rita Mountains,” said Sturgess. 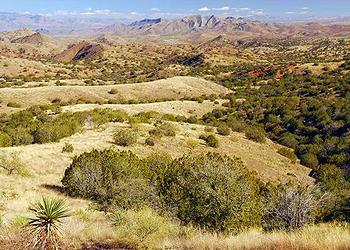 But the new critical habitat designation does include the Santa Rita Mountains. It consists of six units, each containing one or more mountain ranges in which jaguars have been recorded in recent years or through which they are thought to have traveled. The designation includes the Baboquivari, Pajarito, Atascosa, Tumacacori, Patagonia, Santa Rita and Huachuca mountain ranges in Arizona; the Peloncillo Mountains that straddle the Arizona/New Mexico border; and the northern tip of the San Luis Mountains in New Mexico’s bootheel region. Missing from the designation, says Robinson, are the Chiricahua Mountains in Arizona and stretches of the high, forested Mogollon Rim, including its easternmost terminus in New Mexico’s Gila National Forest. These areas were historically occupied by jaguars and still have suitable habitat for recovery. “While we’re disappointed that the protection omits the best U.S. habitat for jaguars – the rugged Gila headwaters in New Mexico and the pine-clad Mogollon Rim in Arizona – this decision is a milestone that protects much of the borderlands that the first generation of returning jaguars is exploring and inhabiting,” said Robinson. The critical habitat designation comes after years of litigation by conservation groups. It has been almost 17 years after the Service first protected jaguars under the Endangered Species Act in response to a lawsuit brought by the Center for Biological Diversity. In 2009, conservationists won another lawsuit challenging the Service’s 2006 determination that critical habitat was “not prudent” for the jaguar because there were too few jaguars in the United States to protect. On March 30, 2009, in a consolidated case brought by the Center for Biological Diversity and Defenders of Wildlife, the U.S. District Court for the District of Arizona set aside the Service’s previous “not prudent” determination and required the Service to issue a new determination on whether critical habitat designation is prudent. The court did not order the Service to designate critical habitat, but ordered the Service to reevaluate whether designation of critical habitat for the jaguar is prudent. Meanwhile, another conservation group, WildEarth Guardians, reached a multi-species settlement agreement with the Service in May 2011, which requires the agency to make listing and critical habitat determinations on 251 candidate species by the end of 2016. The Service first proposed critical habitat for the jaguar in August 2012, later revised the proposed habitat to exclude some areas and include others and then was granted two extensions for the final rule: the first so the agency could consider new jaguar sightings in Arizona in the first half of 2013 and the second because of delays in the economic analysis due to the government shutdown, explained Taylor Jones, endangered species advocate for WildEarth Guardians. Although WildEarth Guardians and the other groups did not collaborate on the jaguar critical habitat designation, Jones expressed appreciation for their work. “Without the Center’s lawsuit on the jaguar specifically, which forced the Service to reconsider its “not prudent” determination, we would not have been able to ensure a timely proposed and final rule in our settlement agreement,” she said. Peer-reviewed research shows that species with designated critical habitat are twice as likely to make progress toward recovery as those without such habitat. The Fish and Wildlife Service now plans to release a draft jaguar recovery plan this spring.